Brilliant cut sapphires are complemented with sparkling diamonds weighing a fifth of a carat in this beautiful half-eternity 18ct gold ring. Perfect as a symbol of your true love and commitment, this beautiful ring will take your loved one's breath away. 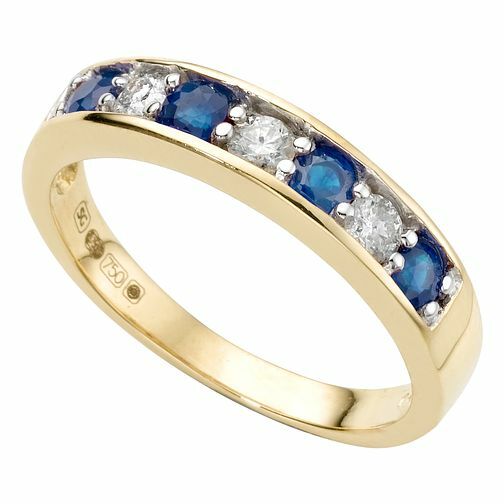 18ct gold sapphire and diamond 0.20ct half-eternity ring is rated 5.0 out of 5 by 2. Rated 5 out of 5 by Anonymous from Sapphire and idamond half circle18 carat eternity ring Beautiful ring perfect to celebrate our anniversary after 38 years together. Now a widow, it is even more important to me that we chose it together. We researched so many but this one stood out as special.